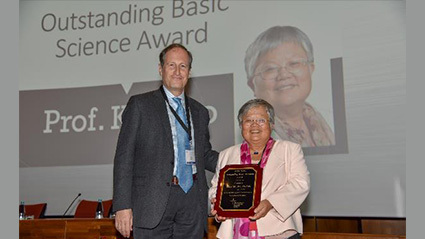 Kim Do receiving the 2018 SIRS Outstanding Basic Science Award, and Professor René Kahn. Kim Do has devoted most of her career to understanding the origins, effects and potential opportunities linked to an observation she made in patients suffering from schizophrenia. As a pioneer of the translational approach to psychiatry, Kim Do’s determination, commitment and expertise could end up delivering concrete treatments. At a time when her global approach has just earned her a prestigious award, Kim Do present her work to Synapsy. The young Kim Do always thought she would make a career in medicine. But her exam results –which were particularly brilliant in basic science–made her change her mind and turn instead to chemistry and molecular biology. It was after her PhD thesis in molecular biology in the field of enkephalins and a stay in Paris to study endorphins that Kim Do shift to neuroscience and basic research in neurobiology. She then started her research at the Brain Research Institute of the Swiss Federal Institute of Technology in Zurich, where she studied excitatory amino acid neurotransmission. In 1994, Kim Do discover that glial cells are able to release transmitters. She identified inter alia that astrocytes are capable of releasing agonists of NMDA receptors, such as glutamate and homocysteate. Combining neuroscience and psychiatry was not an easy thing in the 1990s. Kim Do managed to find a sympathetic ear and an open mind at the CHUV psychiatric hospital in Cery, where she set up a laboratory for psychiatric neuroscience in 1999. Her idea was to start with observing patients and then move towards animal models. The task was not simple, recounts Kim Do : “I was given premises formerly used by patients : there was plenty of free space but otherwise nothing.” The immediate priority was to set up a small animal facility. “The mice were delivered to the cafeteria, and the chef asked us : ‘how would you like us to prepare these delicacies for you?’” says Kim Do with a smile on her face. Once the laboratory was up and running, the aim of Kim Do’s research was to investigate the origins of glutathione deficiency and its effects on animal models in order to identify underlying mechanisms, allowing the back translation to patients. The collaboration with Philippe Conus was crucial for linking research to a clinical cohort. The subsequent integration into Synapsy as a work package (WP#2-Biomarkers of early psychosis) meant that funding was available for the cohort alongside extensive opportunities for brain imaging and systematic phenotyping. “The contribution made by Synapsy has been major and we are very grateful,” says Kim Do. Today, the connection between impairments of glutathione, antioxidant defense, oxidative stress, neural networks and psychoses has been established. Remarkable clinical trials are now underway, focusing on personalised treatments for patient subgroups with a disrupted redox system. Everything is taking shape with promising outcomes during Phase-3. How was this success achieved? Our translational approaches, says the Synapsy researcher, are highly rational and often bear fruit : they start from observations in patients and progress through mechanism based experimental research before being fed back to the patient. Kim Do further explains that, although consortia of researchers and clinicians are imperative for translational methods, “the human aspects and an open mind” are even more important than stated intentions, and lead to productive collaborations. She adds that Synapsy has made it possible to train young clinician-scientists, who strive to bridge the gap between basic neuroscience and psychiatry, even though each is a specialty in itself. “It’s this bridge that makes the whole difference,” says Kim Do.